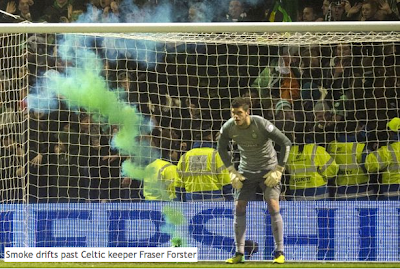 If You Know Their History: Celtic fans putting "lives at risk"
YOU couldn’t give a section of Celtic’s support a red neck with a blow torch, never mind the green flare they threw on to the pitch at Fir Park. And then they got on with the wanton damage that saw seats destroyed while Motherwell boss Stuart McCall was subjected to chants about being a “sad Orange b*****d”. Some people just have no sense of irony. The team the misguided had paid to watch is currently in the best form it has enjoyed for a long time. But the football is never enough for those who have taken a weird turn since Rangers went into liquidation. The obsession with insisting that Gers died – and the current side has a history 18 months old – has come with an arrogance that was unpleasant to watch at Motherwell. Lennon said his heart sank when he saw the banners depicting William Wallace and Bobby Sands which disfigured the Champions League game with Milan. Now the manager and his chief executive, Peter Lawwell, have to speak out against supporters who are blemishing the club’s reputation. Celtic have just updated and republished the book detailing their history over the last 125 years – and it is a story well worth the telling. A team started for charitable purposes has always had what their greatest captain Billy McNeill described as a fairytale aspect attached to it. Celtic’s appearance in the Nou Camp on Wednesday night vouches for their decent standing in Europe. And the derision their efforts receive from the rival support at Ibrox is an irrelevance since that is based on the need for something to camouflage their current, lower-league status. It is as unthinking as the damage that’s being done to Celtic’s good name by the unruly element who will now make their club the object of the SPFL’s attention. But all of that unwanted attention is meaningless to the vandals, flare throwers and obscene chanters. If you can embarrass your club while the team is 5-0 up then you don’t do sober reflection. And what’s even worse is that any attempt to draw attention to the supporters’ misbehaviour is always met with a hostility based on a belief that no such incidents ever happened, or could happen, where the Celtic support is concerned. 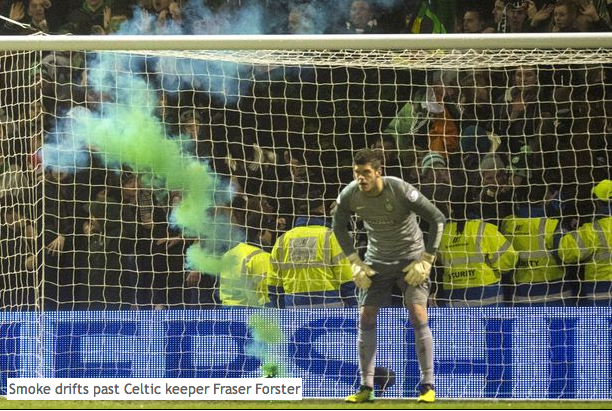 There are signs of old-fashioned hooliganism returning to Scottish football. A flare was thrown on to the pitch during Rangers’Scottish Cup tie at Falkirk causing damage to the artificial pitch. Money is a constant source of concern at Ibrox, particularly when serious-minded men-in-the-know don't rule out the possibility of a second insolvency event. So how regretful should the culprits feel when they see to it that a cheque for damages has to be forwarded from Ibrox to Falkirk? The answer is they’ll probably feel no remorse whatsoever and they won’t until somebody does something to halt a growing menace. The Old Firm game used to be a safety valve that was periodically released to take the steam out of a poisonous rivalry. Now they live separate lives and the result has been the misfits have to release their troublesome instincts in another way. is they don’t recognise the kind of person they can find beside them today. I also got a close-up look at Motherwell’s incendiary division last weekend because they were fouling the air, and making a nuisance of themselves, in the vicinity of the press box at Hamilton’s ground. They go through their dance routines then let off their toys, at which point several people emerge from the crowd to film their smoke-shrouded pals on their mobiles. Older Well fans, meanwhile, were congregated well away from them and getting progressively more irked by their team’s performance. They made displeasure known in the traditional, verbally-colourful manner then started to leave before Albion Rovers scored the winner. But the dance troupe didn’t have any real sense of how badly their team had played due to the fact they didn’t appear to be that bothered by what happened on the pitch. In the meantime they had caused damage to seats belonging to the club who hosted their game as a courtesy to both Lanarkshire neighbours. That will cost Well money they shouldn’t have to pay at a time when every penny’s a prisoner. Those supporters also threw another canister on to the pitch, forcing the people in wheelchairs to take evasive action. You’d think supporters of a club whose manager was involved in a stadium disaster that claimed the lives of 56 people because of a fire would consider his feelings before setting light to canisters in a stand containing thousands of their fellow supporters. One of the most harrowing conversations I’ve ever had with McCall recounted his memories of that day in Bradford. The hand-burning sensation he felt when he tried to open his car door two hours after the dead and the dying had been removed to hospital. The search for his father that ended in a case of mistaken identity when Stuart was pointed in the direction of a man with first-degree burns. Now McCall is working in an environment where we’ve started to breed our own pyromaniacs. It is an offence to enter, or attempt to enter, a football ground while in possession of a flare, smoke canister or firework. Possession of either one carries a custodial sentence if the court believes that’s in order. So why are so many being allowed to endanger health and safety on a regular basis? That’s as much of a mystery as the suggestion that McCall has destroyed his own managerial reputation because his team had an off-day in a Scottish Cup tie. Put that in your canister and smoke it.